I am calling this dessert old fashioned caramel cake because it has a yummy caramel icing that reminds you of caramel candy. 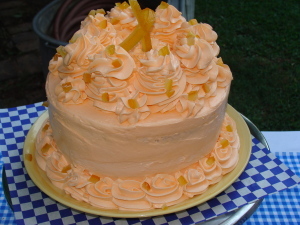 To make it even better, it’s hugging on a luscious yellow cake. 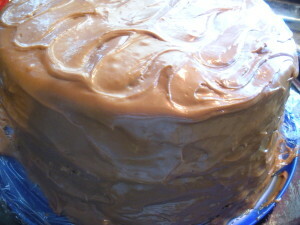 I have to admit, this cake gave me a hard time because, it’s a caramel cake which means you have to make caramel! Problem was, I couldn’t find my candy thermometer so I think I overcooked my caramel a bit as it was really like caramel candy, thick and shiny and I couldn’t spread it. I put it in my Kitchenaid and whipped it about 20 minutes. I put it in a container and in the fridge overnight and the next day I put it in a pan over another pan of hot water. When it warmed and became pliable again, I added about 1/4 can of evaporated milk and about 2 c of confectioner’s sugar and let it cool. After it cooled, I iced my cake and it was so good! 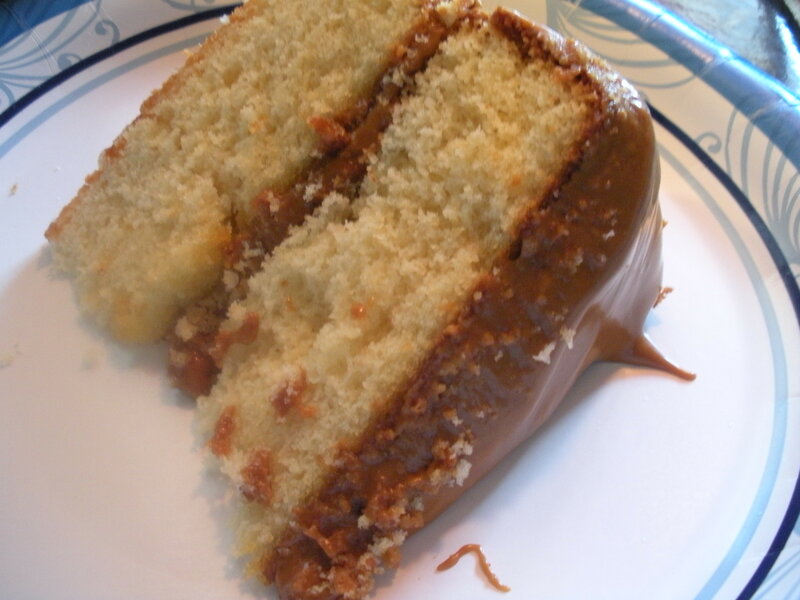 It really did remind me of old fashioned caramel cakes we use to have at church! I still am not 100% with this recipe because I want the icing to be a little more whipped but this will do just fine until I perfect it! Enjoy! For me, a caramel cake is the ultimate "old school, remember when, like Grandma use to make" dessert. This isn't the final recipe but it's darn close and so good you've got to try it. Please let me know what you think and what you did to make this recipe better! Thanks! Put 2 sticks of salted butter in a heavy bottom pot over medium high heat to melt. Add sugar to melted butter and stir while sugar melts. Cook until light brown. Add evaportated milk and reduce heat to medium low. Cook until smooth stirring occasionally until a candy thermometer registers 240 degrees (soft ball stage). Remove from heat and beat with a wooden spoon or mixer about 20 minutes until shiny. Heat oven to 350 degrees. Grease and flour 2 - 9" cake pans, set aside. Cream 2 sticks of unsalted butter together with 2½ c of granulated sugar till fluffy, then add vanilla. Add eggs, one at a time. Sift dry ingredients together and add to wet mixture in thirds. Mix until fully incorporated then pour cake mix into the two prepared cake pans, being careful to pour equal amounts in each pan. 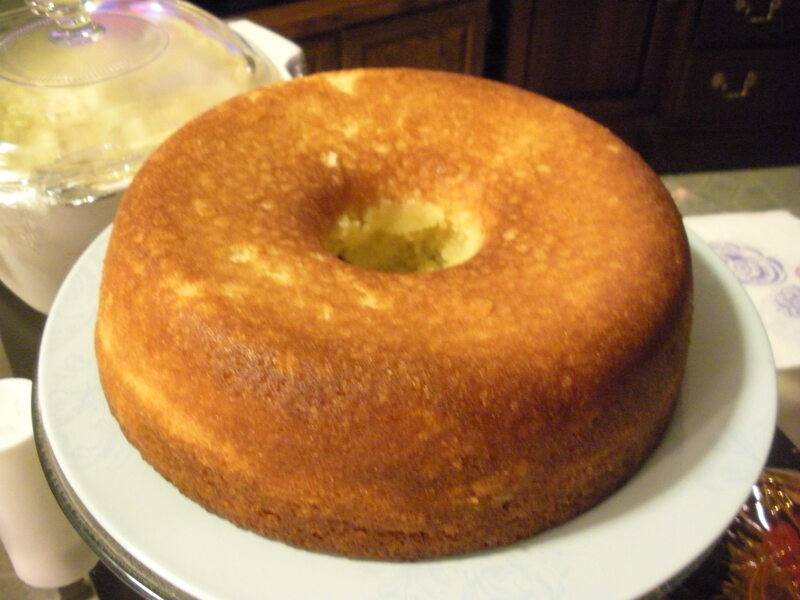 Bake at 350 degrees for 35-40 minutes or until you can insert a toothpick in the middle of the cake to the bottom and have it come out of the cake clean. Remove from oven when done and allow to cool in pan for 10 minutes. Remove from pans to rack and cool completely. Frost cake. This is a pie that I fell in love with after eating it at a restaurant that was located at the edge of Piedmont Park in Atlanta… can’t remember the name of the restaurant (whatever on the park – etc) but I definitely remember the peanut butter pie. 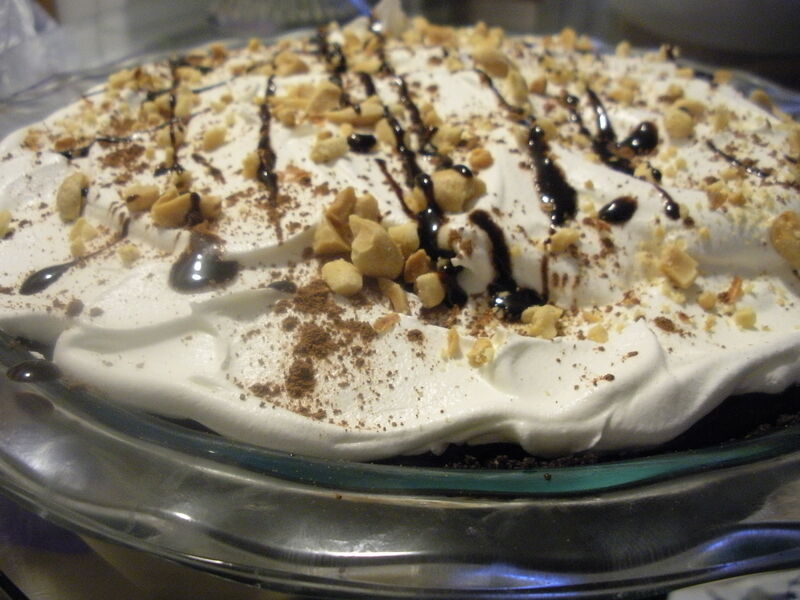 When I made the pie in Atlanta, I recreated what I ate and it really turned out great but now you can find peanut butter pie recipes all over the internet – some look good, some look “interesting“, if you know what I mean! Any who, I played with a couple of different recipes, added some things of my own and so this is my version of peanut butter pie. Trust me when I say, it’s soul good!!! 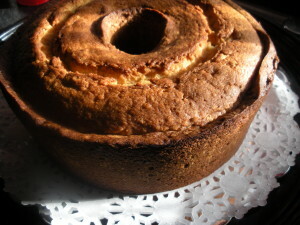 It’s also very rich, a little slice goes a long way, so cut it like cheese cake. Truth is, I made this pie in a cheese cake (spring form) pan and served it at my church as peanut butter cheese cake! It was a hit but again, it is very rich! 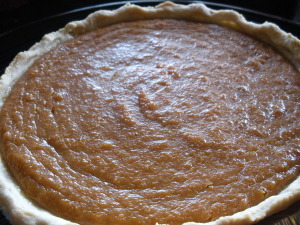 This pie is so delicious - especially if you love peanut butter like I do! Slice it thin cause it's so rich and decadent that a little bit goes a long way! Combine cookie crumbs and melted butter. Mix well to make sure all cookie crumbs are coated with melted butter. Press buttered crumbs into a 9 inch pie pan, taking care to press them up the sides of the pan to create a full cookie crust. Bake crust at 350 F for 7-8 minutes. Remove from oven and set aside to cool. Whip peanut butter and cream cheese together using the medium high setting on your mixer. Add sugar and stir by hand to incorporate sugar into peanut butter cream cheese mixture. Add 8oz cool whip to mixture and mix on medium high setting or your mixture until the filling is totally mixed together. Drizzle ¼ c of chocolate syrup onto cooled crust in bottom of pie pan. Scoop peanut butter filling into into pie shell and spread evenly info shell. Add 4-6 oz of cool whip to garnish top of pie, peaking and swirling. 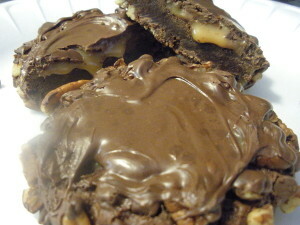 Drizzle ¼ c. chocolate sauce across the top and sprinkle with crushed nuts. Refrigerate at least 4 hours. Sprinkle the top with cocoa, cut, serve and enjoy! Today while doing some online research into soul food recipes, I found a cake recipe on a site written by a man named Corey Jarrell. 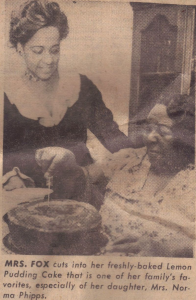 His grandmother, Mrs. Lillian Fox was known for her fabulous soul food and her hospitality, or as the article put it, “Good nature and kindness were Mama Lil’s signature ingredients”. By the way, I’m trying to help Corey find an antique cookbook called “A Domestic Cook Book: Containing a Careful Selection of Useful Receipts for the Kitchen”, by Mrs. Malinda Russell, an Experienced Cook, Paw Paw, Michigan, 1866. A Facsimile with introduction by Janice Bluestein Longone. Inland Press, Detroit, Michigan, April 2007. (ISBN 978-1-4255-8881-6). If anybody has any idea where he can find a copy of this cookbook, please let me know at your earliest convenience and thank you! Mrs. Fox and her fabulous lemon pudding cake. I made Mama Lil’s Lemon Pudding cake and it was as good as it looks in the photo I took. Everybody loved it! I actually made two and took one to church. 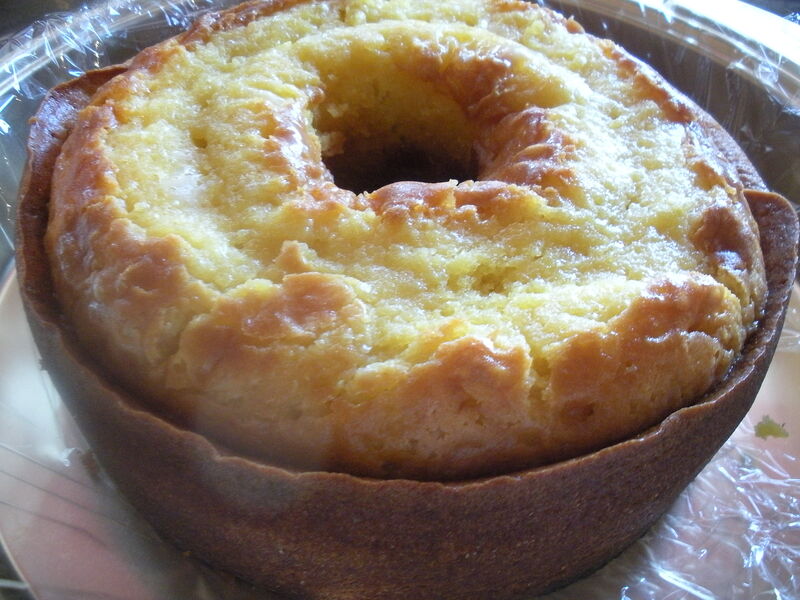 So moist and lemony, really good! The photo below is my version of this over the top fabulous cookie! So good!!! Harvest time may be the perfect time for a dessert called Pumpkin Delight, but it’s good any time! 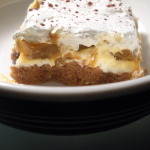 I have made this 4 layered dessert in a couple of different flavors but this one (pumpkin) really is good – really, really good! This dessert can be found online under various different. Until I get the Sweet Potato Delight recipe put together – please enjoy this 🙂 . It really is as good as it looks! Enjoy! Combine all ingredients under crust and mix well until mixture resembles wet sand. Pat graham cracker mixture into a 9x11 pan baking pan or any pan of your choice similar sized. Put crust into a 350 oven and bake 10-12 minutes until you can smell the ingredients. Be careful not to over brown your crust. Remove from oven and cool. When completely cool, squirt or pour ¼ c. chocolate syrup over the crust. Using an offset spatula, spread the syrup evenly over the crust. Using a hand mixer, whip cream cheese and powdered sugar together until well blended and fluffy. Spoon cream cheese mixture on top of crust and spread over crust evenly, sealing all edges so next layer doesn't drip or drizzle to bottom of pan. Spoon and spread pudding evenly over the cream cheese layer. Refrigerate the dessert 4 hours. 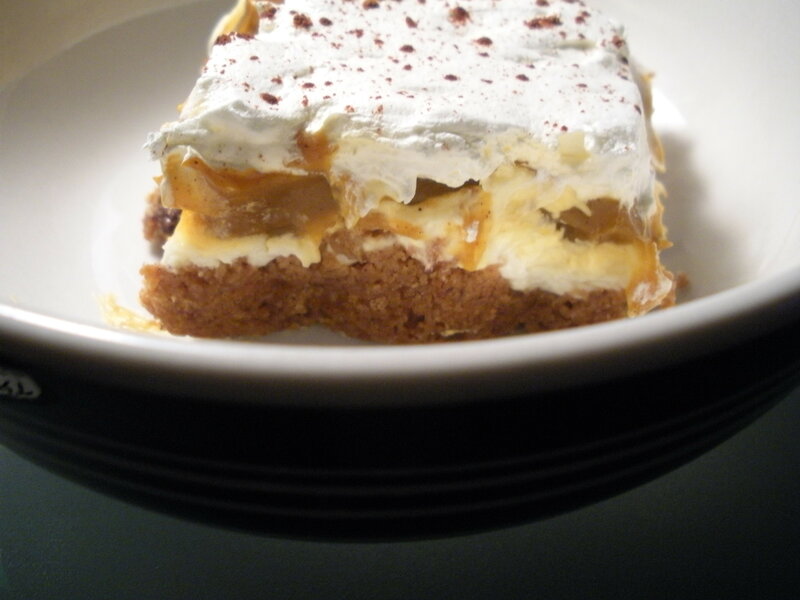 Remove dessert after chilling and top with final layer of cool whip. Sprinkle cool whip with coco powder or chocolate shavings. Cut into squares and serve. 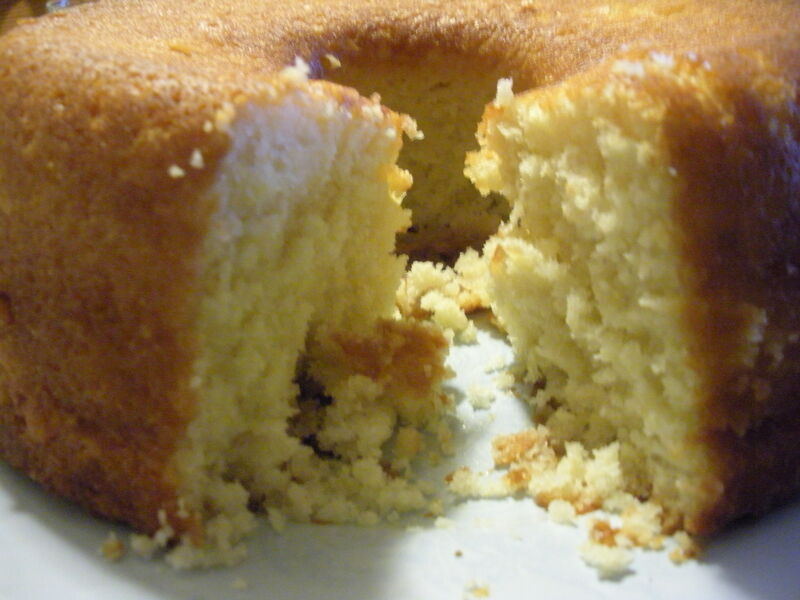 Serving size: 1 piece - 3" x 3"
Ok – this is my sour cream pound cake recipe. I’m actually eating a piece of it right now. It’s so good – not too sweet, moist and flavorful. Great flavor and tender crumb! My sister Becky said she dosen’t like biting into a grain of kosher salt every now and again but I love that the most – sweet and salty! If you want to just use regular table salt, go right ahead and of course it blends into the batter. I hope your family likes it as much as my family does! Update: I baked a cake without the kosher salt and Becky said, “where’s the salt that you used in your last cake, it was so good”! Go figure!!! Cream butter, shortening and sugar until light and fluffy. Add eggs one at a time, beating well after each addition. Add vanilla and lemon extract to milk and add to butter mixture. Add sour cream and mix to combine. Sift dry ingredients together. Add dry ingredients to wet ingredients in three equal additions, beating just to blend, until all ingredients are combined. Mix for an additional 1-2 minutes. Place into greased and floured 10-inch tube pan and place into COLD oven. Bake at 425 degrees for 20 minutes. 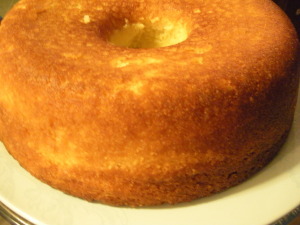 Reduce temperature to 350 and continue to bake for 1 hour to 1 hour 15 minutes or until a cake tester inserted in the middle comes out clean.